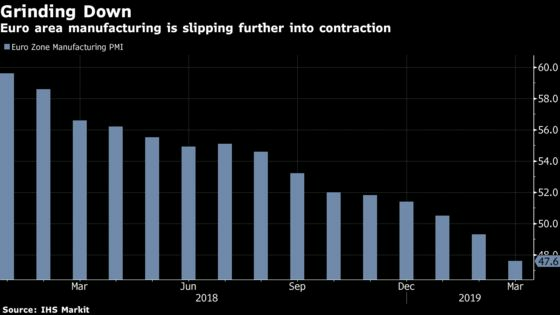 (Bloomberg) -- Germany’s contracting manufacturing sector held back euro zone growth this month as global trade tensions continued. IHS Markit’s composite Purchasing Managers’ Index for the region slipped to 51.3. Economists expected an improvement to 52. Manufacturing contracted while activity in services held steady. Growth was probably 0.2 percent in the first quarter based on the survey, Markit said. The euro fell 0.6 percent to trade at $1.1309 as of 10:12 a.m. in Frankfurt. The European Central Bank this month recognized that the economy is weakening by announcing a new program of long-term loans for banks. Officials say they’re still determining whether the slowdown is temporary after they ended a bond-purchase program at the end of 2018. German manufacturing shrank for a third month. The French economy slipped back into contraction after improving in February, Markit reported earlier.